Overwhelming evidence indicates that heightened achievement factors are likely to come from sources other than a child's DNA. Was Mozart born with a musical gene? Was Tiger Woods born a golf champion? Was chess master Bobby Fisher a strategic prodigy? As we examine their journey to excellence, we quickly recognize their accomplishments were a result of external influences rather than a byproduct of inborn DNA. World renowned table tennis player Matthew Syed writes in his book Bounce, "Top performers are not born with sharper instincts (in the same way that chess masters do not possess superior memories); instead, they possess enhanced awareness and anticipation." Syed later goes on to state, "It is practice, not talent, that holds the key to success." Maybe your goal is not to raise a Mozart or a Tiger Woods; however, as a parent or teacher you ultimately desire the best for your child. Irrespective of whether you believe in the talent theory or not, here are five immediate steps you can take to influence your child's development and their future. Encourage your child to explore natural interests by participating in different activities. Exploring an assortment of activities leads to exploration and discovery for you and your child to choose the best fitting options. Influence your child to practice and refine necessary skills to promote developmental progression. While this advancement varies based on each child's individual development level, natural tendencies, and parent-to-child investment, research indicates that to master complex tasks, one must invest approximately 10,000 hours of quality practice over a ten year period. Although this figure may sound extreme, when broken down, practicing 18 to 19 hours a week is further deconstructed to approximately 3 hours per day. Within this scope, the realistic expectation is to simply challenge and push your child beyond their current limit with the end goal of effective long-term learning. It is critically important, however, to remember that pushing your child to extreme limits when they have no desire to do so, may actually do more harm than good, so be sure to communicate openly with them on this journey. Provide expert feedback and guidance to enhance skills throughout development. This often comes in the form of a specialist or skilled coach/teacher. Additionally, encourage your child to share their experience of the training and activities. Are they enjoying the process? Are there clear signs of interest and engagement? Always remember to approach achievement with a balanced perspective that encourages your child to develop personalized interest and a natural desire to practice. By raising your "word awareness" and how your child is influenced, you will quickly understand that what you say and how you say it leaves a lasting impression. Through conducting a situational assessment before making a comment or answering a question, you elevate your influence and impact. Simply take a moment to consider the long-term effect and ask yourself, "Will my words help or hurt my child?". While positive reinforcement shapes the dynamic of your relationship and your child's overall performance, this verbal tool is often misunderstood. Yes, a little positive reinforcement does go a long way; however, careful use and consideration to what you are reinforcing as positive will determine what your child will work for and become. What you consider as positive reinforcement may actually be setting your child up for false expectations and disappointment. Children may tend to seek out approval in all of life's activities if you continuously praise them for every small task or accomplishment. As an alternative, express how much you enjoy watching them play and participate. Read The Hidden Dangers of Praising Your Children. Lastly, evaluate your child's surroundings and direct influences. Ask yourself if they are positive or negative for development. When working with a coach or instructor, carefully consider their approach and knowledge. Do they berate your child or other team members? Is the primary focus on winning or team building and personal development? History suggests that many top performers have followed similar steps like these. As a parent or schoolteacher, you recognize the immense value of investing in your children, but are you actively working on your investment strategies? 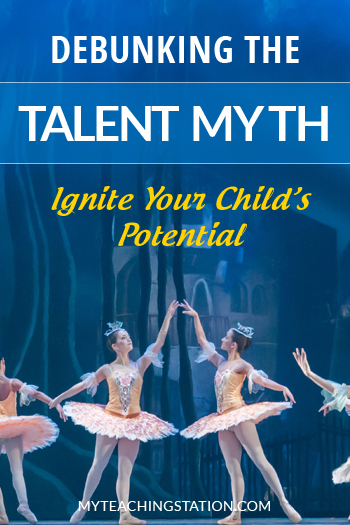 Are there damages in bypassing these steps and simply relying on the talent myth? Will your child forsake the pursuit of their dreams if they fail to see immediate results by believing they don't have what it takes? Practice produces awareness, which in turn develops their knowledge and skill sets. If they don't have the knowledge or skill, how will they succeed? These five steps are only the starting point; the ball is now in your court. Be careful not to fall into the trap of expecting results with little or no effort. Assess how this applies to your child's development routine and what adjustments are needed to produce the desired outcome.